We must live for the few who know and appreciate us, who judge and absolve us, and for whom we have the same affection and indulgence. The rest I look upon as a mere crowd, lively or sad, loyal or corrupt, from whom there is nothing to be expected but fleeting emotions, either pleasant or unpleasant, which leave no trace behind them. A magician makes the visible invisible. A mime makes the invisible visible. Life's but a walking shadow, a poor player, that struts and frets his hour upon the stage and then is heard no more; it is a tale told by an idiot, full of sound and fury, signifying nothing. marc chagall ceiling mural in the paris opera - painted in 1964. photo october 2005. Known as 'The Divine Sarah' she was the most acclaimed actress of her time, and not only in Paris, where she was born and pursuit her career, but also on the stages of European and American theatres. In 1859, Sarah received theatrical training from the Conservatoire de Musique et Déclamation, three years later she was already performing as a student of the prestigious Parisian Comédie-Française. Throughout the 1870s, she was recognised as a dramatic actress, performing Racine, Moliere, Shakespeare and others. In 1894, the first lithographed poster advertising her play at the Theatre de la Renaissance was produced by Alphonse Mucha, which resulted in a six-year contract for the artist and a series of Art Nouveau masterpieces depicting the actress. Bernhardt was also a pioneer in silent films, making her debut as Hamlet in 1900. She continued to act even after the amputation of a leg in 1915 and even went on a tour in the United States that same year. Sara Bernhardt is buried in the Parisian Le Père Lachaise Cemetery. eileen ivers and the immigrant soul performing on one of the many musical stages of the cleveland irish festival. they will be back for the 2009 cleveland irish festival and you can count on me being there, but the question is will you be there too? eugene ionesco's grave in in the cimetière de montparnasse. great, all of it, kim. 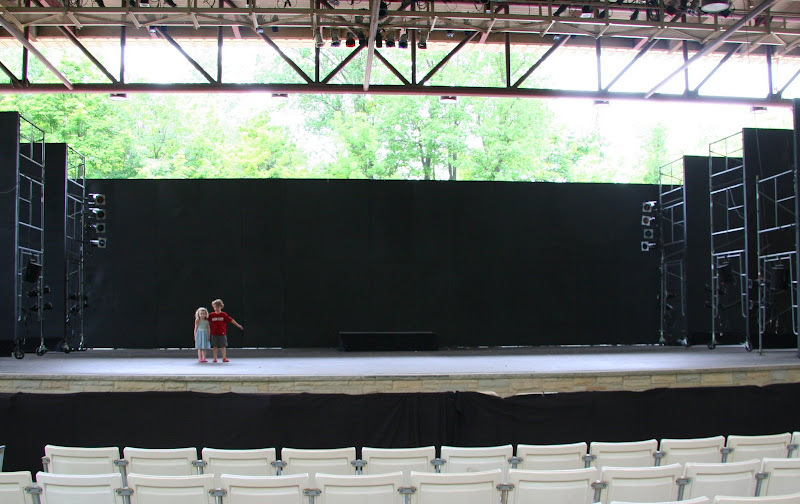 But the shot of the two children on the stage? their placement, the backdrop, I love everything about it. Love the Cabaret excerpt. Makes me want to see it again. The picture from the Globe is excellent, and the quote wonderfully appropriate to it. I saw Patrick Stewart as Mackers a couple of years ago. For a brilliant delivery of this line, see the Orson Welles film of the Scottish play! Wow! That Chagall ceiling. Just, wow! I love the Sarah Bernhardt quote because it fits our blog-world, doesn't it? Gorgeous photos, Kimy. Especially the first one. Oh you do it each week you ratbag! Excellent except for the Paris bit because I've never been and it's on the very top of my to-do list. I love the theatre, I miss it enormously . .I remember taking the kids to Cabaret about 5 years ago and it was wonderful . .even Adam liked it and you know men and musicals. Great collection of photos once again. Where haven't you been? BTW, is Ionesco's grave in Pere-Lachaise? now I have to go back to my photo vault and unearth the truth. I have a recollection of being in the pere lachaise cemetery when I took this photo, but I also visited montparnasse and the montmarte cemetery....and at midnight they all started blurring. I love a good wander through a cememtery! oh and there are millions of places I haven't been! oh minerva is me....I was signed in to post a pic on the lakewood daily snap. whoops, all these roles to play, as with cemeteries, sometimes it is hard to keep them straight! When my daughter visited Paris a few years back, the thing that impressed her the most was the ceiling by Chagall in the Paris Opera House. Fabulous photo. okay.... I have emerged from the vault! ionesco is buried in montparnasse - however, there is someone named "enesco" buried in pere lachaise - and I did take a photo of that grave! by the way, I did take a snap of george enesco's grave - yet another famous and talented romanian buried in a parisian cemetery! if we ever do a theme on graves of famous folks - I will be in really good shape! k - love patrick stewart - how lucky you are to have seen him on stage! baino - oh I hope you get to paris. it is an incredible city. I could go back every year, but alas no funds to make that happen and no longer any family there to put me up for free room and board! two of my three trips to paris were taken in exchange for work; the other I was able to take by cashing in frequent flyer miles. I love the barter economies! kimy, I want that ceiling...and chandelier...and gate( amazing bit of metal-work, that ), ACH! the opening snap justs hits you...POW! Superb quotes and...oh heck, you know! So many kinds of stages...the gate is amazing, makes me want to make some effort to make paper sculptures. Always so great, I love them. But the mime/clown dude? Awesome. I take it that you have been in Paris recently. The one chance I will ever have to go to Europe, the first thing I did before arranging anything else was to buy a ticket for an opera in the old opera building -- gold trim and red velvet seats -- like sitting inside a giant rose -- and that Chagall ceiling overhead. A wonderful range of photos, thanks for sharing. Great photos and quotes as usual! Have a great day! we find our stages every where. i bet those kids are having fun and it seems so immense to them. while i imagine to the mime, his seems immense as well. great as always! Thank you again for a another wonderful TT post! I knew you'd have some great shots for this one. I just knew it!